I was in EB games and stumbled upon a Playstation 2 >> Playsation 3 converter, which essentially is a PS2 >> USB converter and thought to myself HMM, I wonder if I could use this to play GH3 PC with my PS2 guitar, cause I hate the xplorer so much. Figured it all out, so here it is! Plug it into the back of your machine. If all goes well as it did for me, windows xp should pick it up as a controller. 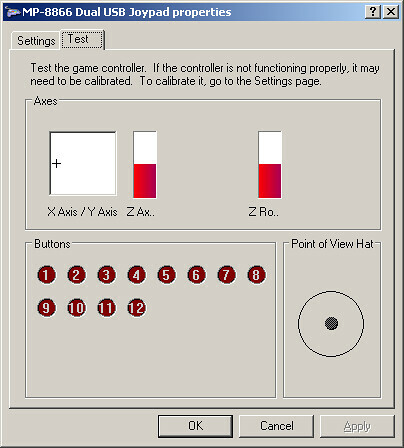 - I mapped the Select button to ']' and Tilt to '\'. Why did I map both star power activations different? Because the whammy bar has no joypad input I couldn't get this to work and so I'm using ']' as a static whammy. If anyone can help me on this part it would be great. Hope this works for you guys, it saved me a lot of frustration working with the xplorer. I was able to tap the intro to TTFAF with no problems, so response time is great. Also was able to double strum without problem. The only downside so far is the whammy bar. I am thinking about trying out Tilt as whammy and leaving select as star power. This way holding the guitar vertically assures constant auto whammy, while select as SP doesn't hurt anything. Little tip if you want to use the PS2 Kramer - I have a cheap Radio Shack PS2 adapter. With the SG, whammy is not supported - strum bar maps to the left analog axis, which is where the whammy normally maps on a PS2. I tried out my Kramer with it for shiggles, and then I managed to find out that if you hold Start and Select, and then strum down, it will switch the strum bar to the POV hat which will allow the whammy to work like normal on the left analog axis. I'm not sure if this is a function on the Kramer itself, or if it's just something different about the Kramer that allows the adapter to do this - I'm thinking it's the former, however, because I'm pretty sure the LED next to the power switch toggles on and off when you do this. I tried this with the SG and it did not work at all. Alakaiser sez: POST BECAUSE YOU HAVE SOMETHING TO SAY, NOT BECAUSE YOU HAVE TO SAY SOMETHING. ok so I have the white wireless PS2 Guitar, and I have GH3 on my pc and I have the ps2 to ps3 usb adapter from Pelican. When I plugged it in, my computer recognized it and installed it and it said it was ready to use but my white guitar won't sync with the dongle. I turn the guitar on and it'll blink a few times but then the light turns off. When I turn the guitar off the light on the wireless receiver for the guitar starts to blink but when I turn the guitar on it stays solid but the guitar light doesn't stay solid. Any idea's of how I can fix this? I think there is a way to fix the Whammy bar problem of the PS2 controller on PC, but im not sure if this really gonna work because i cant test it yet. But this little trick works for normal gamepads so maybe there is a chance that it also will work for the Guitar Controllers. Then you must find the map which contains your gamepad. My computer recognize my PS2 controller as "MP-8888 USB Joypad" so you i'm gonna search trough the maps which contains an OEMName file named "MP-8888 USB Joypad". Ok, now I was thinking to try this trick for Guitar Hero on the PC with a PS2 Guitar Controller, the only problem is that I don't know the OEMName of the PC Guitar Controller, so I can't test this. My question is if anyone of you here got the PC version of Guitar Hero 3 with the USB Guitar, (Xbox360 controller is also fine) so that he can give me the OEMName of USB Guitar that works fine with the PC version. It allows mapping of an axis to horizontal movement of the mouse which works as a whammy in gh3 pc. Still isn't quite perfect but from messing around with the threshold and deadzone settings you can come up with a fairly good sound. Posted: Sat Jan 19, 2008 11:45 pm Post subject: Getting the whammy bar to work. I finally got my Kramer guitar today and the first thing I tryed was to connect it with my pc. I used joytokey to map the guitar to my keyboard and because the whammybar didn't work I mapped it to the select button. But after playing for a while the strumbar wasn't responding anymore. So I went to the control panel and saw that the strum bar now was acting as the pov button and the whammy bar was mapped to the y axis! I just couldn't work out how I did this, so I went to try every button combination there is. After a while I learned when you hold down start+select and then strum down (strum up when holding your guitar left handed) the guitar changes 'modes' it seems. Normal 'Guitar Mode' and 'Controller Mode'? Now you can bind pov up and down to your strum buttons and your whammy bar to the whammy button. Now you have a fully working Kramer on your PC! Does anyone know if this works on vista too? Dude....I think you're on to something here. If you find this out please please PM me. I'm using Pinnacle Profiler and i've got everything BUT the whammy working. Would be great to be able to access the calibration options. Ok, Call me crazy, but here is what I see. I have the Super dual Box Pro PS/PS2 to USB Converter. On Vista, went to the Game Controllers in Control Panel and found my adapter. It sees my guitar as: Tiger Game PS/PS2 Game Controller Adapter. When I go into Properties and start mashing buttons, I see events for all of the buttons, Tilt, but nothing when the Whammy is depressed. 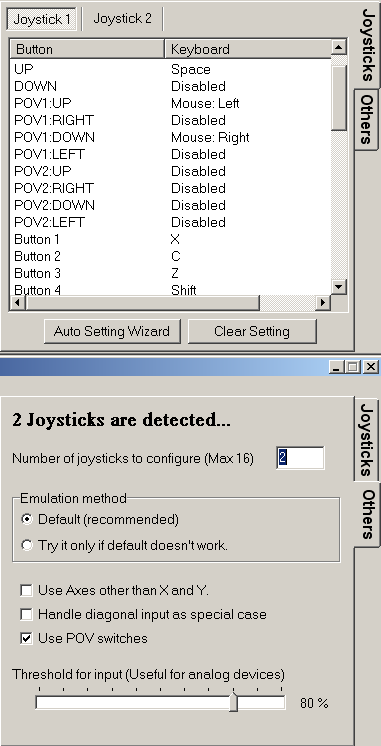 I don't think the issue is in the JoytoKey or ControlMK, but in the device driver itself. If the driver doesn't see an event triggered, then there is nothing to map. There has to be a way around this, but it might be from the converter manufacturers. Ok, I am crazy, because I think I got it. I mapped in GH3 for PC, the Whammy to Right-Alt. Then, I went into the TigerGame Controller Adapter, and switched the Controller Mode to Analog. Then, When I depressed the Whammy, The Test Box on the right moved left. Now, In JoytoKey, I went to preferences, and Checked the box marked: "Use Axises other than X and Y"
Now, Went back to Joysticks, found Axis3(0) and mapped this to Right-Alt. Bingo. Got Whammy!!!! I have the FrontMan Guitar for PS2, and everything now works. ok, ive got a similair problem, except my drivers dont have an analogue mode, does anyone have any drivers they could up that could be compatible with this? now all i have to do is work out how to make drivers. Wow.. you're on something interesting.. I bought two wireless guitars on ebay(TAC) with a dual box pro converter..
Everything works purrrfect for one guitar.. Since Gh3 only supports one keyboard, my 2nd guitar is useless..
Did you found out what was the OEM name for an original guitar? Maybe someone with some HeX skillz could check into the code to see for what name it looks..